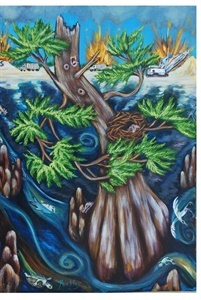 North Florida has been my home for most of my life and my images depict the land, trees and wildlife. I believe there are many layers to the perception of reality and that art reveals deeper layers than most people perceive. 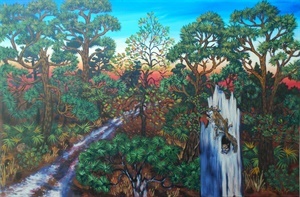 My art digs down to soulful, spiritual or mythical dimensions of places and beings. I want others to see and love the ethereal and Eden-like beauty of the world around us. People read all visual form and project their feelings and experiences onto what they see. I deliberately infuse my images with connections and relationships. 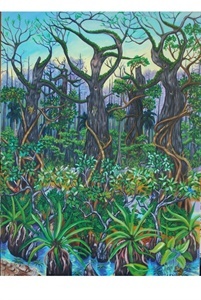 Gnarled forms reveal a triumphant history of struggle against the elements. Communities of individuals coexist in harmony and support each others survival. I want to inspire people to identify with and cherish life through meaningful imagery. Oil on Canvas. This spring is on the Suwannee River near Dowling Park. I spent a lot of time here as a youth because it was only a few minutes away from my parent's farm. This tree hangs over the water at Devil's Eye Spring on the Ichtucknee River. It reminds me of some Medusa-like goddess protecting her spring. It is oil on a gallery wrap canvas. 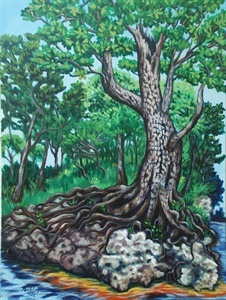 This is one of my more surreal pieces inspired by a tree on the Ichetucknee. 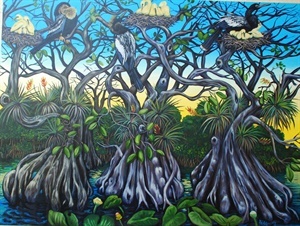 I was inspired to paint this image after Levy County decided to allow a limerock company to destroy 4000 acres of pristine swamp. 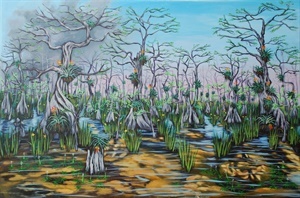 Inspired by a stand of dwarf cypress behind Clyde Butcher's gallery on 41. 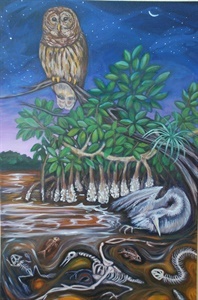 A Miccosukee man said "she can't breath and purify the water because her pores are plugged with chemicals and waste from cane farms"
$6500 original painting, $695 giclee on canvas, $160 matted giclee 18"x24"
Gallery wrap oil on canvas of Everglades dream. 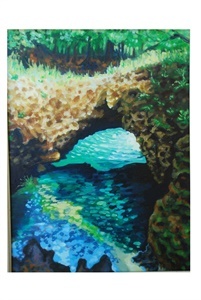 Plein Air oil on canvas of Poe Spring where the run meets the Santa Fe River. Corkscrew trees through the lens of my imagination. Plein Air painting of long leafs. Framed in pine frame.